More than 35% of US Corporations offer meditation or mindfulness training to their employees: Google, Apple, IBM, Intel, McKinsey & Company, General Electric, General Mills, Nike, Sony, Ford, Target, IKEA, eBay, LinkedIn, and the U.S. Marines, to name a few. What is driving this trend? After all, meditation has a history dating back more than 7000 years. It’s not as though it is a new invention! Our escalating war with distraction and stress. Competition in business is increasing, addictive devices like smart-phones add to stress and interfere with our ability to focus, and 85% of doctors visits are stress related. We desperately need an alternative to medications with harmful side-effects, or non-prescribed drugs with their set of problems. Brain related meditation research. Modern advances in brain monitoring technology have enabled a huge and growing body of meditation research which validates the practice as having a long list of scientifically verifiable benefits with virtually no downside. Adoption by influencers. Business icons like Steve Jobs and Jeff Weiner of LinkedIn, as well as a host of Hollywood celebrities, cite meditation as one of their keys to success. Here are just a few of the benefits reported from the research. With all these benefits, it’s no wonder that executives everywhere are joining this new trend. 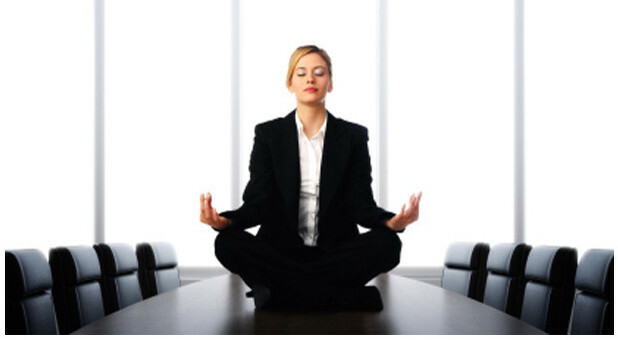 Would it make sense for your company to offer meditation training to your team?